Media coverage: The Telegraph (11 April 2011), The Independent (6 April), Press Association (6 April). Members of the European Parliament (MEPs) voted today in favour of a Resolution to block a disputed DHA health claim on follow-on formula labels, but were short of the absolute majority of all MEPs (including the 57 not present) required to compel the European Commission to act. The vote was 328 for the Resolution and 323 against, but this was insufficient to block the claim: “DHA intake contributes to the normal visual development of infants up to 12 months of age”. Click here to find out which MEPs voted for and against the Resolution. This is the first time since the Health Claims Regulations were passed in 2006 that the Parliament has voted on a claim. The Resolution came to the full Plenary following a positive vote by the Environment, Public Health and Food Safety (ENVI) Committee in March. Above: A typical marketing image from Mead Johnson, which registered to use the DHA claim, showing how the company idealises formula with DHA as improving baby’s eye sight in many countries. Following legal action and investigations in the US Mead Johnson has stopped making such claims in the US. Speaking after the vote, Labour’s Glenis Willmott MEP, who led the challenge to the claim, said: “Today a majority of this parliament voted against this health claim. MEPs have concluded that scientific consensus simply doesn’t exist. Yet now manufacturers will be free to target parents with marketing messages that many medical professionals and health organisations believe should not be allowed. If the Resolution had been passed the claim, which is already being used around the world in marketing campaigns, would have been outlawed. Campaigners allege bogus arguments have been made in favour of claim. Esther de Lange MEP from the Netherlands suggested that blocking the claim would deny improved formula and information to mothers who couldn’t breastfeed because of HIV/AIDS, early births or cancer. DHA was legally permitted as an ‘optional’ rather than a ‘required’ ingredient in formula because when the regulations were last reviewed it was found to have ‘no proven benefit’. It is noteworthy that Esther de Lange was a lobbyist for German fruit juice and alcohol trade associations before entering Parliament and in 2010 sponsored Breakfast Week for the European Breakfast Cereal Association (which includes baby food giant, Nestlé). The cereal industry is particularly supportive of health claims and is apparently wanting to add DHA to cereal to be able to make claims about aiding brain and eye development. Particularly damaging to clear evaluation of the scientific evidence was an intervention by Professor Berthold Koletzko a researcher who has for years worked with the baby food industry. He is the recipient of the Freedom to Discover Award of the Bristol Myers Squibb Foundation, owner of Mead Johnson at the time, the company that filed the application to use DHA claims on formula. Prof. Koletzko is also lead author of a paper recommending the addition of DHA to formula which is widely used by the industry and arose from a scientific workshop; the paper acknowledges: “The scientific workshop held at Barcelona was financially supported by Martek Biosciences Corporation.” He wrote to MEPs in the name of the German Paediatric Association, but did not declare his many industry connections. Click here for Baby Milk Action’s briefing on the DHA claim. In the United States, the Food and Drug Administration has noted evidence of adverse reactions to formulas with DHA and requires companies to keep track of such cases. The FDA has recorded 98 cases itself by 2007. What is the evidence that addition of DHA and ARA to infant formulas is beneficial? The scientific evidence is mixed. 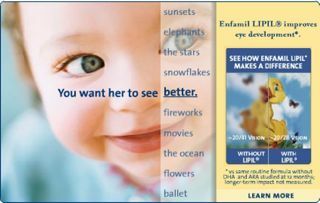 Some studies in infants suggest that including these fatty acids in infant formulas may have positive effects on visual function and neural development over the short term. Other studies in infants do not confirm these benefits. There are no currently available published reports from clinical studies that address whether any long-term beneficial effects exist. I understand that oils containing DHA and ARA have been added to infant formulas for several years in other countries. Isn’t there information from those countries on any long-term benefits or adverse consequences of formulas containing these fatty acids? Systematic monitoring efforts are not in place to collect and analyze information on effects of infant formulas containing DHA and ARA in countries where these formulas are in use. Why has FDA asked manufacturers to do postmarket surveillance of infants consuming these formulas? These are new ingredients that were not used in infant formulas in this country before early 2002, and infant formulas containing ARASCO (ARA Single Cell Oil) and DHASCO (DHA Single Cell Oil) have been marketed in other countries for only a few years. FDA views any evaluation of the safety of use of new food ingredients such as DHASCO and ARASCO as a time-dependent judgment that is based on general scientific knowledge as well as specific data and information about the ingredient. Therefore, scientific data that become available after specific products containing a new ingredient enter the market must be considered as a part of the totality of information about the ingredient. Pre-market clinical studies evaluating the effects of infant formulas containing DHASCO and ARASCO on physical growth and some aspects of development are short-term studies, while some studies suggest that feeding of infant formulas with oils containing DHA and ARA to infants may have long-term effects on growth and development. For all these reasons, manufacturers have been asked to closely monitor these new infant formulas in the marketplace.